This book was amazing. In December 1982 a young woman by the name of Debbie Carter is raped and murdered in the small town of Ada, Oklahoma. The crime is very violent and rocks the tight community. It seems from the beginning that the police do not seem very concerned with solving the case. They make up their minds that two men in town committed the crime and steer their investigation to them. The men are Dennis Fritz and Ron Williamson. Ron has certainly fallen from his heyday as a star baseball player in the town. Several years before he was drafted by the Oakland A's and had dreams of big league stardom. However, an injury cut his career short and he goes home dejected. His fragile mental condition deteriorates until he is the crazy guy in town. It was fairly easy for the police to pin the crime on Ron and Dennis. They are both convicted with Dennis getting life in prison and Ron receiving the death penalty. Now their families and legal teams must fight to save their lives. This book made me very angry. It should make everyone who reads it angry. We are raised to believe that the American legal system is fair and just but this book makes you question that belief. It is scary to think how close Ron came to death and how the time on the row lead to his deteriorating condition. 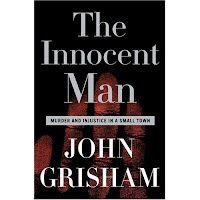 There are several other stories that Grisham brings forth in the book of men who were wrongfully convicted. This book really solidified my beliefs about the death penalty. I have always believed in the death penalty in theory but that it does not work in actuality. This book proves that to me. I know the proponents say that no innocent person has ever been executed but after reading this book I do not know how they can say that with a straight face. This is a book that really makes you think. Grisham's first foray into non-fiction does not disappoint.